A soldier in Syria's President Bashar al-Assad forces near the Yarmouk Palestinian camp in Damascus. Syria's government captured at least two villages from U.S.-backed Syrian Democratic Forces east of the Euphrates River near the border with Iraq. A U.S. official confirmed to NPR that pro-regime forces took control of two villages. 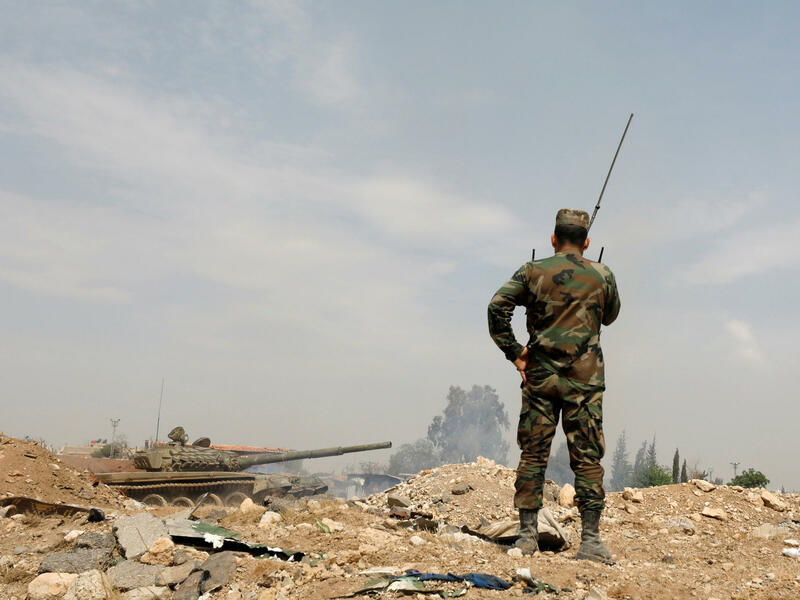 A U.S.-backed coalition worked to deescalate the clashes, and fired one artillery round toward the advancing Syrian forces as a sort of "shot across the bow," the official said. "Close enough," the official said, "not at them." The U.S.-backed SDF forces have been led by the Kurdish YPG militia since 2017. Through a campaign last September that drove out Islamic State militants from eastern Syria near the Iraq border, SDF forces control much of the territory east of the Euphrates. As NPR's Ruth Sherlock has reported, the area is economically important — whoever controls it "will have a greater say in the post-ISIS carve-up of Syria. It is an important bargaining chip at the negotiating table with the many different players of the country's civil war." The Syrian government, led by President Bashar Assad, was accused of killing dozens of Syrians in a chemical attack earlier this month in Douma, the last rebel-held enclave in eastern Ghouta. President Trump authorized airstrikes on Syrian targets to retaliate, and the U.S., Britain and France carried out airstrikes on areas allegedly linked to Syria's chemical weapons program.